I’ve played hours of the remastered version of Burnout Paradise prior to today’s release of the game on Xbox One and PlayStation 4. So how are the higher resolution textures and enhanced lighting effects? I don’t know, man. I’m just playing Burnout Paradise again, and it’s as wonderful as it ever was. ... the crashing is nearly as satisfying. Developer Criterion are the masters of making players feel speed and impact, be it on the road or in deep space. The road beneath my wheels rumbles, my vision rattles, sight lines blur—it’s a glorious feeling. 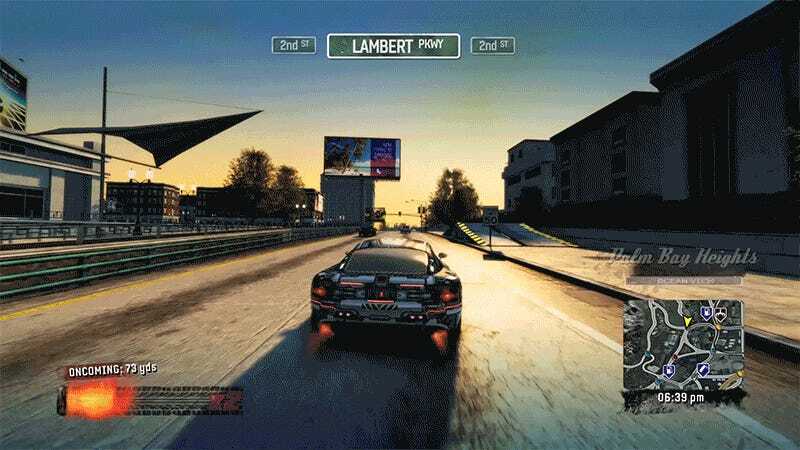 But it’s not just the speed and impact that makes Burnout Paradise so good. Paradise City is the ideal driving playground. Each road is layered with jumps and shortcuts. Each junction branches off into multiple potential paths, each as thrilling as the last. Once you start driving in the game, it’s hard to stop. The racing lines never end. Having all the DLC cars unlocked at the beginning is cheating, and I am fine with that. I hardly ever participate in actual races in the game—I was tickled watching Tim Rogers stream the game the other day, taking on various events one after another. I never want to slow down long enough to do the same. Maybe I don’t like being told where to drive. If I want to spend hours playing the game and never earn a single license upgrade, so be it—that’s the freedom Burnout Paradise affords. As for this whole remaster business, honestly it doesn’t make a lick of difference to me. I suppose the 4K, 60 frames-per-second thing on the PS4 Pro and Xbox One X is nice. Hell, I didn’t even realize my One X was set to 4K until I went to record some footage and wound up with a much larger file than I expected. So that’s good. If you’re really into the differences between the old and new textures, MotoGamesTV put together a lovely three-way comparison of the game running on the Xbox 360, Xbox One S and Xbox One X. Sometimes the differences are obvious. Sometimes not so much. But it’s always Burnout Paradise, and that’s a very good thing.